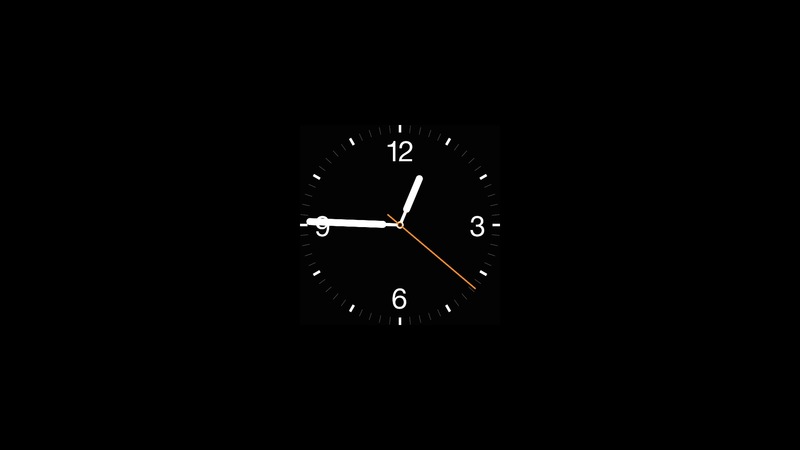 Whether you’re a big fan of the actual Apple Watch itself or not, you have to admit the default watch face screen is rather beautiful and well designed. 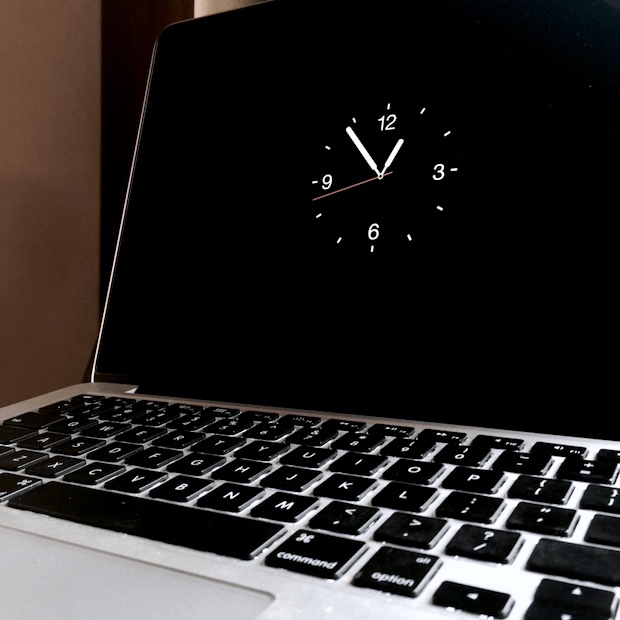 Not only does that watch face screen look great on a wrist, but it also happens to look fantastic on the Mac too, so if you’re a fan of clocks and minimalist screensavers, don’t miss this nifty Apple Watch screen saver for Mac OS X. 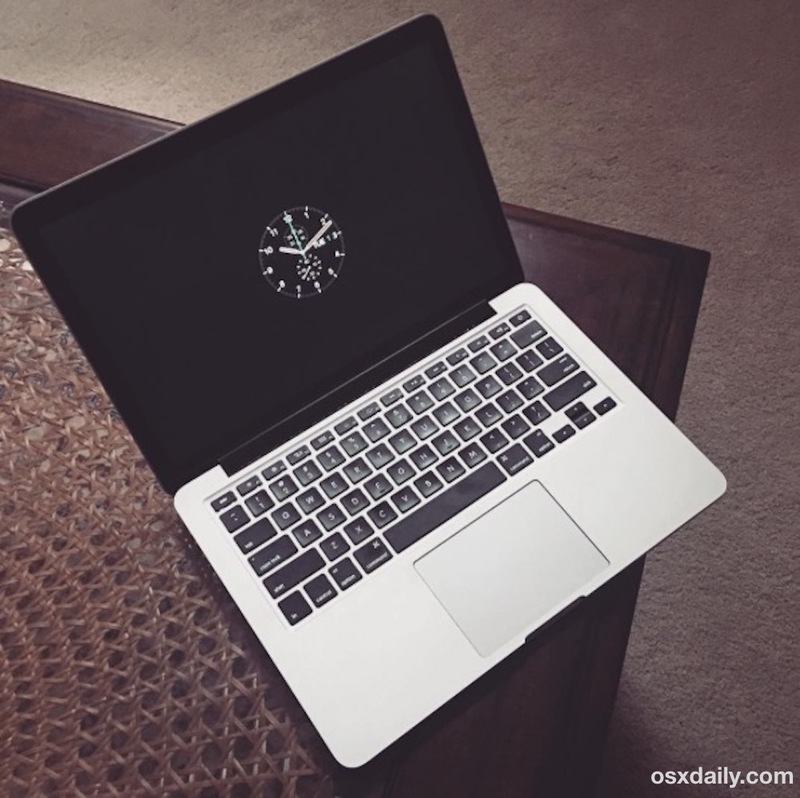 The Apple Watch screen saver for Mac OS X is free to download and, much like installing any other screensavers on the Mac, it’s really easy to start using. Simple, beautiful, functional, pretty great screen saver, isn’t it? By the way, if you aren’t doing so right now, be sure to set a password for your screen saver, which will lock the screen until the user logs in to the Mac, this is a simple security tip that helps to prevent unauthorized usage of a Mac, easy to do and recommended. 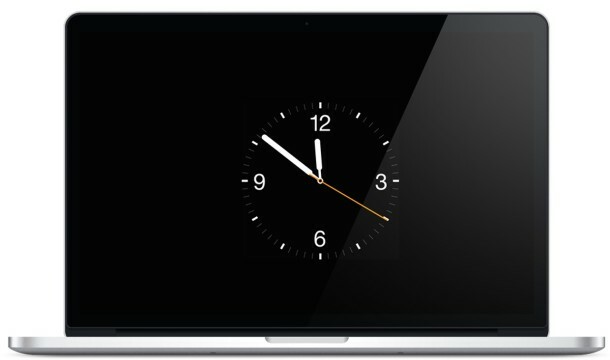 If you like this Apple Watch screen saver on the Mac, you’ll probably appreciate the iOS Lock Screen inspired screen saver in OS X too, which looks like the iPad and iPhone. If you’re not into either of these though, we have discussed quite a few other screen savers on the Mac, so if you explore a bit you’re sure to find something you enjoy. Heads up to iPhoneHacks for finding this jazzy screen saver. 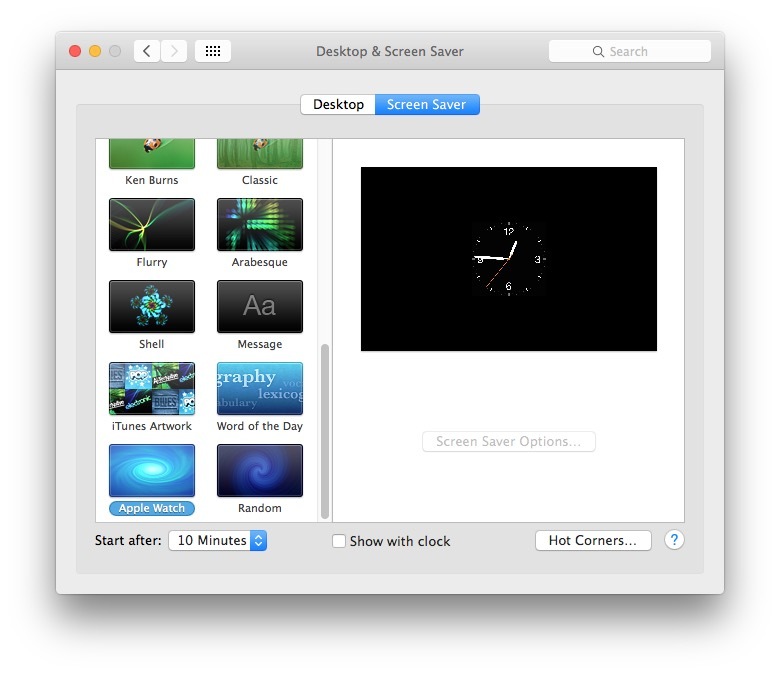 Apparently I am putting the screensaver in the wrong folder – all I get is the different pictures from the clock. The hands, the circle, etc … the screensaver function can only read this as pictures. Apparently this guy didn’t test on older systems. Crashes System Preferences on 10.8.5. I bet he didn’t test it in Windows 95 or BeOS either, the nerve of some developers! Can’t believe some of these devs only support 5 year old operating systems like OS X Mavericks, OS X Yosemite, OS X El Capitan, what if someone on an Atari 2600 wants this screen saver? What now developer? You just going to tell us Atari owners ‘tough luck’ and abandon us? This is why I support Trump 2016, he is going fix it! WATCH has potential but it’s not there yet. I have an Apple Watch that sits around now collecting dust. I used it a lot for a few weeks, then I left it at home over a long weekend and realized I didn’t miss it. I tried to use it again but I realize that with WatchOS 1 it’s slow and kind of frustrating, I’ll update it to WatchOS 2.0 in a few weeks and I hope that speeds it up, the little wait cursor on it right now makes it feel very beta. Expensive beta product! Give it another year or two, and it will be much more useful, and much more popular. Needs to be faster, have cellular abilities to not rely on the iPhone, better battery life, etc. Thanks, but it would be great to be able to set e.g. optional clock movement (that it stays on one place only for a defined period), otherwise it’s not a screen saver, but a screen burner, especially with that “white on black”. Option to set the clock size as well as more “skins” (especially darker ones) would be great. No problem here, it works perfect and it’s much nicer then the genuine (digital)clock. System: OSX 10.10.5 on a MacPro 5.1 12 core (mid 2010). I have the San Francisco El Cap font installed to, nice. Amen to that, but they’re like an endangered species in these days of heifers! Nice screen saver by the way. I like the screen saver a lot. I installed this an it seems like the watch face stays centered on the screen all the time. Couldn’t that cause “burn in” of the watch face if left on for a long period of time? I know the hands move, but the rest does not. Have experimented a mac reboot by itself and some days later a total system freeze, on OSX 10.10.5, mac mini late 2012, 16g ram , ssd Samsung, during pause, LogicPro 10.2 opened. I suspect this screensaver, since as usualy, my set up is rock solid, never a crash … But I’m not 100% sure. For those worried about screen burn, just modify the second hand in the package contents to a larger size so it will sweep the full size of the clock. The StarMessage screensaver (a windows screensaver) was just ported on MAC OSX. How do I uninstall the Apple Watch Screen Saver, I’m really tired of it! got the bright idea to upgrade to Sierra and now none of the watches have hands. Is there another version in out future that will accommodate this? Love it while it lasted. Doesn’t seem to work on Yosemite here (can’t upgrade to Sierra). Any former version available please ?